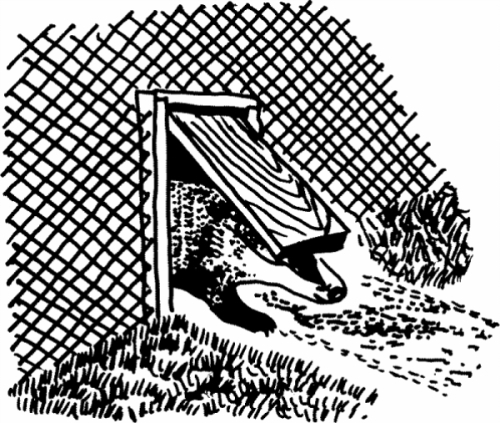 Note that the badger gate is a heavy wooden door, which is hinged from at or near the top. It is too heavy to be moved by smaller animals (such as rabbits), but the heavier badger can simply barge through. The gate can be installed to swing both ways (to allow for entry and exit), or it can be fitted with a "stop" to make it a one-way gate. The gate shown above (courtesy of DEFRA) shows a typical wooden gate in situ (this opens both ways). 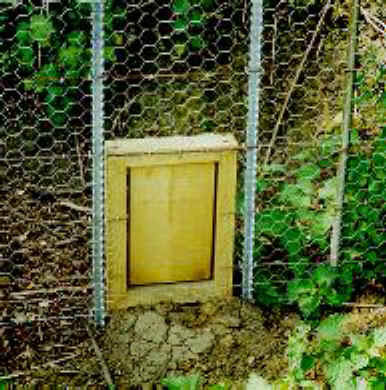 Some badger gates may have a strong open mesh panel set into the gate, as this allows the badger to see that the other side of the gate is a safe area to go to. It is also preferable to use a wood which resists rot or use an odourless wood preservative.